Our focus in February, as Rotarians, is to reflect on the broad and somewhat gigantic theme of Peace and Conflict Prevention/Resolution. Initially the mind seems to be drawn to images of war, destruction, anger, weapons, refugees, winners and losers, and inhuman treatment of people. And of course this is perfectly correct. The difficulty of these mind images is the enormity of it all, and hence the seemingly impossible task of being able to address it, let alone find and work towards a solution. Who would have guessed that 'expectations' would be a key factor! And peace is determined by, in lay terms, people's understanding of each other. There are many areas where we see the 'peace broken' - in personal relationships (family and domestic violence), workplace conflict, harassment and bullying, gang warfare, and so on. This started me thinking about the things we Rotarians do to encourage and sustain peace. 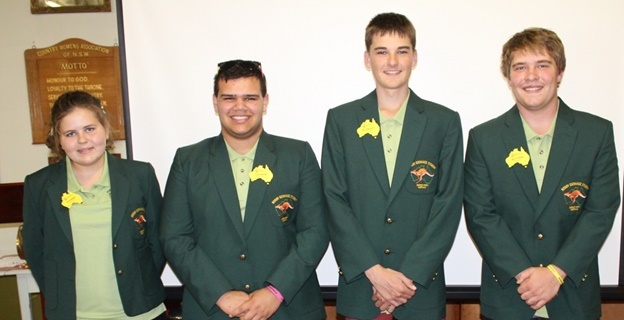 Early in February we welcomed back to Australia 4 mature students who had just returned from 12 months overseas - Mitch from Forbes, Tayla from Wagga Wagga, Elijah from Leeton (remember we did a story on Elijah some months ago) and Bailey from Blayney. They were part of the Rotary Youth Exchange Program. Some Rotarians have argued that this program is just an overseas holiday for the children of wealthy families; however I learnt that many parents have to forgo considerably in order to pay for their child to have this opportunity of a lifetime. The Exchange Students (both inbound, we have 6 in the district currently, and outbound) are often recognised by their blazers with the many pins and mementos received during their stay away from home. And I realised that this program is an expression of the Focus area of Peace. OK, I hear you say, prove it! The Aussie students offer a window to our world and present this to all they meet, as do the inbound students. In essence they are helping to build positive expectations about their countries with their peers, these relationships are also positive. And the proof? Well each student has many badges, each badge could represent an interaction with a person, a club, a series of people, and each of those people will tell their friends and family about the student and so the positive relationship and expectation is shared very widely. It will be remembered for years, recalled often, annual if not more frequent communication will ensue. This has all the makings of a strong international Peace and conflict prevention strategy! No wonder it is so successful. Welcome home Mitch, Tayla, Elijah and Bailey; and we hope Anne, Clara, Hellena, Willis, Mathilda and Victor are enjoying their time with us!